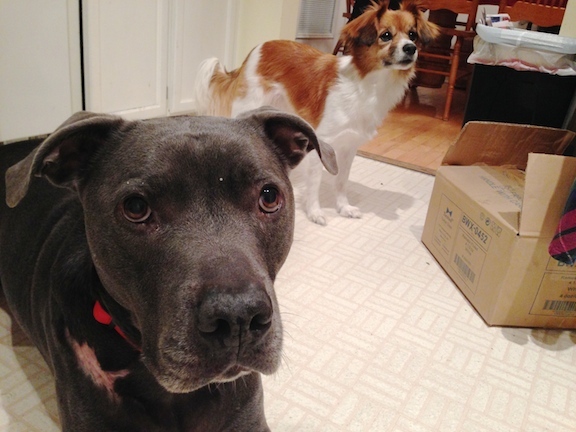 Meet Diesel a six-year-old Bluenosed Pitbull and Marley, a nine-year-old Phalene Pappillion. Their owner called me to help get the dogs back together before the family welcomes a new baby in a few months. The dogs had not been together since a bad fight that erupted about six months ago. Their pregnant owner was lying on the bed with a dog on either side of her before Diesel went after Marley. Because Marley needed to go to get stitched up at the vet afterword, their owner had kept them apart ever since. While this approach ensures that there are no more attacks, it doesn’t afford the dogs the ability to learn to coexist peacefully. When I arrived for the session, Diesel was out and met me at the door. He had a nice medium energy, was curious but not excited and showed zero aggression. While I discussed the situation with their owners, I spent a good amount of time observing Diesel who walked around slowly before calmly lying down after giving me a polite sniff. He showed a nice confident body language, was attentive but not over excited. He responded well to commands and looked every part of the model dog. I put him into his kennel and had his owner bring out Marley so I could observe Diesel’s reaction to the other dog. Marley came into the room with a much different energy. He was clearly more high strung than Diesel, moving quickly – almost darting around the room. He circled a bit, jumped up on the couch with his owners then walked over to sniff me, then Diesel. I watched this out of the corner of my eye as my focus was still on Diesel. I was looking for any signs of distress or aggression as Marley did his thing, but Diesel remained calm. He didn’t ignore Marley, but he didn’t seem to hold much of an opinion either. Usually a dog with aggression issues is pretty easy to read. Their energy level goes up as soon as their target stimuli is present. They pace, raise they hackles, stare, look stiff or uncomfortable – often lowering their head and staring from the side. But Diesel showed none of these. He remained laying calmly in the kennel. After a few moments of observation I let Diesel out of his kennel. Again I was ready to see some aggression and watched intently for any signs but saw none. Even when Marley went over and sniffed and bounced near Diesel, he didn’t react. I concluded that the attack was likely a result of Diesel attempting to disagree with Marley’s unbalanced energy. As I went through the warning signs to look for from Diesel, their owner told me he had been stiff earlier in the day before the attack. She went on to say that Marley’s higher energy level was pretty common for him, including that day. When you have multiple dogs living together, its not uncommon for the dogs to try to rise match the energy level of the highest dog. When a dog operates outside of its comfort zone, it can add stress to the other dogs and thew group. This was likely the case with the fight between the dogs. To help prevent another attack, I suggested that their owners turn their focus to correcting Marley’s issues. While Marley is far from a problem dog, he was almost certainly the instigator of the previous attack. As is often the case when a pit is involved, the majority of the corrections and energy was directed at Diesel. But from what I saw, Diesel was the more balanced dog of the two by far. I suggested that they incorporate some rules and boundaries for the dogs (especially Marley) to help him recognize the authority of his owners. By adding clear rules and structure to their day to day lives, we can help the dogs learn to respect the living environment we want in our homes. I showed their owner a few leadership exercises, how to disagree with unwanted behavior and how to interrupt Marley anytime he started to cross the line of behavior when it came to interaction with Diesel. The dogs interacted a number of times during the session without incident. A few times Marley’s energy level started to get up and his owners interceded with excellent timing. They also saw and stopped Marley from attempting to show dominant body language to Diesel. It will be important for both dogs to see and respect their humans as authority figures. Their interruption of Marley’s dominance and disagreeing with him when his energy level went up will go a long way towards accomplishing that feat. Marley will learn to stay calmer, not be so clingy and to respond when corrected. Diesel will see that his owners have Marley under control which means that he doesn’t need to correct him himself. By the end of the session, their owner commented on what a big difference they saw in Marley’s behavior. I explained that the changes can become permanent if they keep up the rules, correct or disagree with Marley when he gets out of line and take a bit of a cue from Diesel who was by far the better and more balanced of the two dogs. Just another example of a situation where the big bad pit bull was not the bad guy everyone makes them out to be.